Around 11,300 farmers will benefit from a £42 million funding extension as the UK Government guarantees EU funding for another year. The Less Favoured Areas Support Scheme (LFASS) supports hill farmers and crofters in difficult to farm areas. 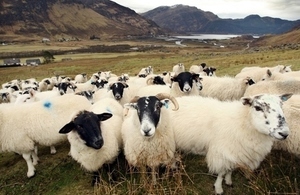 The UK Government has confirmed that it will guarantee applications made in 2019, offering financial support and certainty for farmers and crofters in Scotland for another year. The Government has also guaranteed other CAP Pillar 2 projects signed before the UK leaves the EU, as previously announced by the Chancellor. These moves will give farmers certainty in the short to medium term, while we develop a post-Brexit agriculture strategy which works for Scotland and the whole of the UK. Crofters and farmers are the lifeblood of the Highland economy. Battling challenging conditions they produce world-class food while serving as custodians of the natural environment. Put simply, they shape Scotland, and merit support and certainty as we leave the EU. It is for that reason that the UK Government is guaranteeing an additional £42 million to extend the Less Favoured Areas scheme for an extra year. This will mean payments of up to £10,000 each for Scotland’s eligible hill farmers. This will give farmers greater certainty while we develop a strategy to support our agriculture sector once we leave the EU. Lord Duncan will also host a roundtable later this year with Scotland’s farming sector, to hear about their priorities as we leave the EU. In Scotland, 85 per cent of Scottish agricultural land is classed as Less Favoured Area (LFA), compared to just 17 per cent in England. This underlines the difficult physical and climatic conditions facing Scotland’s farmers and crofters. Lord Duncan announced the funding during a visit to Deskie Farm in Ballindalloch, Moray, where he met representatives of Scotland’s farming sector.